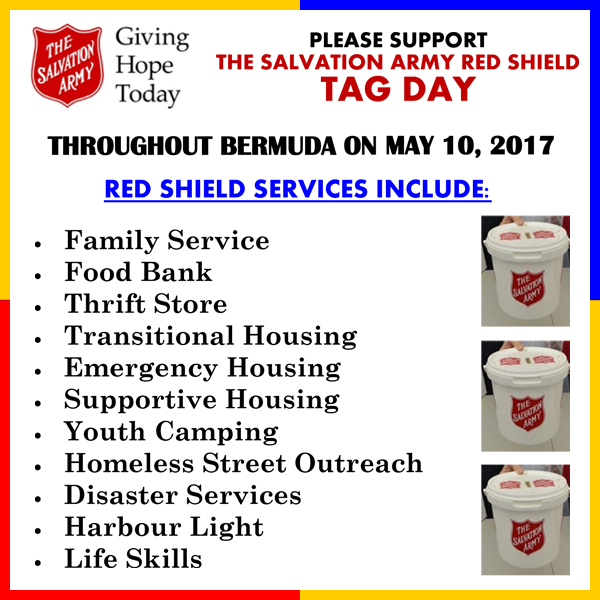 The Salvation Army Red Shield Tag Day will be held tomorrow [May 10] in support of the charity’s array of services they provide to the community, including family services, food bank, thrift store, transitional housing, emergency housing, supportive housing, youth camping, homeless street outreach, disaster services, Harbour Light, and life skills. Bermuda’s social safety net. When all other government, for profit and charity services have said no in Bermuda, the Salvation Army consistently says yes to heal our broken, disadvantaged, tired and hungry. Thank you for all the good work that you do healing our community through your multiple programmes and services. It is an impressive list of eleven direct services in the Red Shield appeal. What more can our community do to support these critical programmes as more and more families seek these services as they are impacted by the lack of economic opportunities.